On December 13 we started shipping our last physical releases of 2010 -- Deluxe Illuminati, Illuminati Y2K, and Munchkin Boxes of Holding -- to distributors. With those three games on trucks and working their way through the distribution system (there's an excellent chance U.S. stores will have Deluxe Illuminati back in stock before Christmas), it was time to sit down and look back at 2010. And rather than keep my thoughts on the year hidden away I felt it might be fun for you to get a look at our year of releases and my thoughts on each month. January -- Often a slow month, this year's January was dead in terms of product releases. This is not the way to run the company, and I need to work harder to make sure we have a steady stream of new games and reprints on shelves every month of the year. March -- Another month without any releases. I'm not doing a very good job at keeping the games flowing, am I? April -- Cthulhu Dice hit shelves in April and it has been a fantastic seller for us. In fact, it's selling so well we pushed the button to get new colors out to stores before Christmas . . . but that's a discussion for a later month. We also shipped the non-curling Munchkin Fairy Dust in April and it is a beautiful pink pack of nasty fun that continues to sell very well for us. 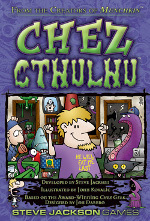 June -- Chez Geek House Party Edition and the July 4 Chibithulhu were our new releases in June, and both did fairly well for us, but paled in comparison to the Munchkin reprints this month: Munchkin 2, Munchkin 3, Munchkin Bites, and Super Munchkin all returned to shelves this month, and they proceeded to sell so fast that we had to scramble to send them back to print. A challenge that we deal with almost daily is keeping Munchkin games and expansions in print, and I think you would be surprised at just how difficult it is to make sure the shelves do not run dry. July -- No new releases this month, but the return of Munchkin 6, Munchkin Quest, and the Munchkin Kill-O-Meter kept the month strong and meant that we had cool stuff for everyone. This was also the month I had too much fun at SDCC, but a discussion of the 2010 conventions is probably best left for another time. August -- In order to get to this month's new release I think I should start by looking at the reprints. Munchkin Cthulhu, Munchkin Cthulhu 2, and Munchkin Cthulhu 3 all came back just in time to give the latest Munchkin Cthulhu expansion, Munchkin Cthulhu 4, a core to build on. And as if that wasn't enough to keep us busy we also shipped the Munchkin Fu reprint to stores, and Steve and I sat down with John Kovalic and went over Munchkin Zombies. It was a busy month, but it was also a very good month. 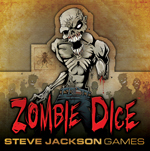 September -- Three new Munchkin releases -- Munchkin Marked for Death, Munchkin Boxes of Holding, and +6 Bag 'o Munchkin d6 -- made this a great month for us, but as if those weren't enough, it was also the month that reprinting Zombie Dice became a huge priority; it was act fast or not have any Zombie Dice for Christmas. And sending children to bed Christmas Eve without any Zombie Dice would be wrong, so we tackled the problem and threw every trick we had at it. To properly top off the month we released reprints of Munchkin and Munchkin Fu 2 and the W23 exclusive Cthulhu Pins. October -- Are you ready for a flood of new releases and reprints? Months of work collided in October as we unleashed 11 products on store shelves. We expanded classics with the Illuminati Mutual Assured Distraction booster for Deluxe Illuminati and Frag Gold Edition FTW for use with the price-reduced Frag Gold Edition. But it was Munchkin that saw the real burst of releases, with four new Munchkin items -- Munchkin Go Up a Level, Munchkin Quest: Portal Kombat, Munchkin Santa's Revenge, and the Munchkin Holiday Edition -- and four reprints -- Super Munchkin 2, The Good, the Bad, and the Munchkin, Munchkin Booty, and Munchkin Booty 2. 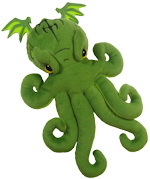 One other new release, our Cthulhu Dice Bag, rounded out the month with something completely new and different for us. November -- Another busy month, November had a total of seven releases. Revolution! The Palace is an inexpensive expansion that adds two players to Revolution! and changes up the way you have to think about strategy when playing the game. Munchkin expansions in November added two new boosters -- Munchkin Booty: Fish & Ships and Star Munchkin: Space Ships -- and the new W23 Munchkin Monstrous Christmas Card to the always-growing Munchkin library. Two Munchkin reprints -- Star Munchkin and Munchkin 4 -- showed that we were starting to get caught up with keeping the Munchkin line in stock (have we ever had the entire line in print at once?). And wrapping up the month was GURPS Low-Tech, the latest hardcover in the series, which has already been expanded on e23. December -- We usually try to not release games in December -- our warehouse closes down mid-month and it's easier on everyone if the new releases ship in November -- but this year delays pushed nine releases into the month. Warehouse 23 got two exclusive releases with the Exclusive Warehouse 23 Munchkin Booster and Munchkin 2011 Christmas Coins, and the distribution network was restocked with Zombie Dice, Star Munchkin 2, Deluxe Illuminati, Illuminati Y2K, and Munchkin Boxes of Holding. The success of Cthulhu Dice throughout the year led to new Cthulhu Dice colors shipping out (how could we resist making more die colors? ), and Munchkin Reloaded gave Munchkin players one last booster for 2010. Whew. No wonder we're all so tired. 2010 was a busy, productive year for us. I'm proud to say that we almost succeeded with keeping Munchkin on store shelves, and we even managed to release new games. Publishing expansions for a few classic games was a great icing to an otherwise great year, but with 2010's print schedule behind us it's time to start getting deeper into 2011. I say deeper, because we already have games and expansions out through June of 2011 at print; my goal is to get the company to the point that we're working on releases one year before the release date, and while we are not there yet, we are closer than we were last year at this time. 2010, a year of successes. Thank you to the staff for the hard work, and thank you to all of our distributors, retailers, and fans for helping make the 50+ releases in the year worth the effort and expense it took to create them.